When you are planning to buy an air hockey table there are several different types to consider. The type of table you need will depend on a few different factors including your budget, the space you have available, and how intensely you plan on using the machine. 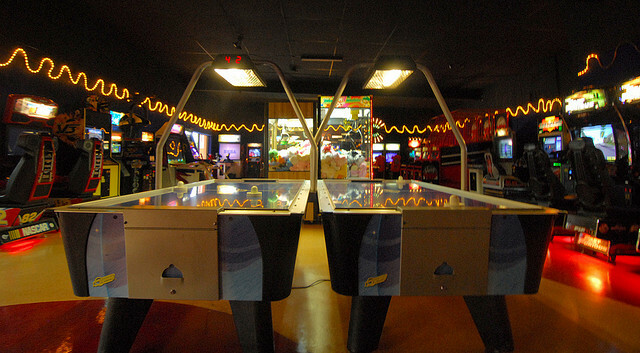 This article will help you determine which type of air hockey table is best for your needs. The first type of air hockey table we will discuss is a tabletop unit. These tables are usually about three to four feet in length, and will sit on top of most kitchen tables. If you do not want your air hockey table to be a permanent fixture in your home, or you are limited for space, then this is the type of unit you need. It can be stored away when not in use, and then brought out for a game when needed. The other advantage is that table top air hockey machines are typically quite inexpensive. Arcade style air hockey tables are similar to the ones you would see in an arcade, the obvious difference being that you do not need to insert money to play. These tables typically have more of the bells and whistles like electronic scoring and a higher quality blower motor. These machines are usually six to eight feet in length and need a dedicated space to sit in your home. The price of these types of tables can run from $100 into several thousands of dollars depending on quality and features. In my experience, the highest quality and best air hockey tables are arcade style units. Combination air hockey tables are growing in popularity as manufacturers have found ways to make them higher quality. Typically this will be an air hockey table that can convert to one or more other games including billiards, ping pong, foosball, and other table games. It is important to find some good air hockey table reviews when it comes to this type of table as the quality can vary. Make sure you are getting a quality unit that will last for years to come. These tables typically run from $500 into the several thousands of dollars. The advantage is that you get several table games in one unit, at a much lower price than buying all of them separately. If you want to play some casual air hockey at a cheap price then the table top air hockey units will be what you are looking for. Those who want to play intense games of air hockey on a high quality table will want an arcade style unit. Finally, if you want several games in one table then I would highly recommend getting a combination air hockey table. The arcade and combination tables are typically more expensive, but keep in mind that you get what you pay for. One final consideration is the age of the players who will be using the air hockey table. If you are buying a table for children keep in mind that a smaller table might be better so that they can reach the puck even when it sits at the center. Bob Ireland is an avid air hockey gamer who enjoys playing every day. When he is not playing air hockey he is reading and writing about the game. What Are The Different Types of Horse Races? A Guide for Beginners! Which are the most popular games for Kids? 10 Fascinating Facts About Paintball Replace or Repair Your AC Unit – How to Decide What Makes a Successful Mobile Gaming App? Thank you for this great content. I think that the best option for kids is tabletop. Am I right?